Welcome to the 52nd edition of the Carnival of Divided Government - Special April Fools Day Edition. April Fool's Day - The Dividist can think of nothing more foolish than permitting either major party to govern and legislate without the moderating effect and enhanced oversight found only within the constraints of divided government. "Think of The Fool not so much as naive as open-minded and optimistic. 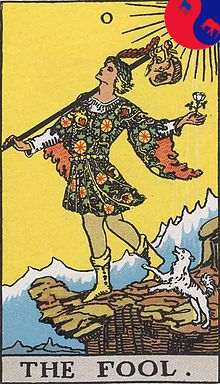 The Fool is hopeful and positive, and he's doing his best to shine a light on new beliefs, innovative and shocking ideas and the unpredictability of life." As explained in earlier editions, we have adopted Latin ordinal numeration to impart a patina of gravitas reflecting the historical importance of the series. In this the Carnival of Divided Government LII (Duo et Quînquâgintâ), as in all of the CODGOV editions, we select volunteers and draftees from the blogosphere and main stream media writing on the single topic of government divided between the major parties (leaving it to the reader to sort out volunteers from draftees). Consistent with this topic, the primary criteria for acceptance in the carnival is to explicitly use the words and/or concept of "divided government" in submitted posts. A criteria that, to our endless befuddlement, is ignored by many of the bloggers submitting posts, which sadly results in The Dividist reluctantly ignoring their fine submissions. Among the on-topic posts, essays and articles we choose our favorites for commentary and consideration. We hope you enjoy these selections, and without further foolishness, we submit for your consideration this month's selections (actually published on April 2nd - gotcha!) . The Dividist wonders whether Lowrey appreciates that what is true about separation of power into texecutive, legislative and judicial branches is also true within the context of partisan make-up of the legislative and executive branches. Congress has demonstrated that it is all too willing to abrogate constitutional responsibilities and cede power to the executive branch when the executive is of the same party. The point is this: Madison's constitutional checks and balances are undermined when one party controls the executive and both legislative branches. We saw a Republican controlled Congress pass an unfunded new entitlement and launch an unfunded preemptive war at the behest of an executive of the same party. We saw a Democratic controlled Congress support an extraordinary expansion of executive war-making authority and erosion of civil rights under a Democratic President that they resisted under a Republican President. We saw trillion dollar Obamacare and Porkulus legislation passed on a pure partisan Democratic Party vote. All of these issues and legislation would have certainly been moderated if one party did not hold all the keys to power. The way to keep our constitutional checks on power reinforced and not undermined, is for some of us to consistently vote to prevent one party control of the executive and both legislative branches. "The Democrats just seem to care more about people than do many Republicans. And that's why I support divided government, other than the fact it only takes the House to rein in spending." The Dividist agrees and welcomes Mark Anderson to the United Coalition of the Divided. 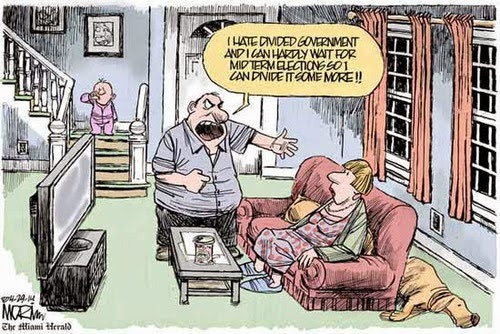 "Historically speaking (so I’m told), divided government is best for restraining government spending. When one party controls the legislative and executive branches, it goes hog wild. Consider these two choices: a Republican House and Senate with Obama in the White House, or a Democratic House and Senate with Romney in the White House. The former seems preferable. I think Romney would compromise too much with the Democrats. I know the right thinks the Really Big Thing is Supreme Court nominations, but that’s just one issue, and I don’t think it should dominate political decision-making. Another option is a Republican House, a Democratic Senate, and Romney as president. That might be the best outcome." You were told correctly Mr. Krehbiel (reference links in Mr. Healy's entry below) and welcome to the United Coalition of the Divided..Although it should be said that the empirical evidence only shows that divided government restrains the growth of spending and does not reduce it. But then, nothing does. Regarding the specific configurations of divided government outlined in Krehbiel's post, the Dividist will happily take "all of the above". As a practical matter (some seven months from the election) the Dividist's best analysis would indicate that the House is a lock for Republicans, and control of the Senate is an unpredictable coin-flip. That only leaves the reelection of Barack Obama as the odds-on voting strategy to ensure the continuation of divided government. "Should the GOP take the presidency, unified Republican government will present its own challenges. The late Bill Niskanen, longtime chairman of the Cato Institute, noted that America "prospers most when excesses are curbed, and, if the numbers from the past 50 years are any indication, divided government is what curbs them." Per Niskanen's calculations, since the end of World War II, unified governments have spent roughly three times as fast as divided ones, and they've been much more likely to waste blood and treasure abroad. Maybe the days of the "K Street Project" are over, thanks to a Tea Party movement energized by Obama's abuses—but they'll need to keep holding the Red Team's feet to the fire.As law professors Eric Posner and Adrian Vermuele point out in their book "Executive Unbound": "The continuity across presidencies is striking. Richard Nixon respected and advanced liberal Great Society programs ... [and] under Reagan, government spending continued its advance." Obama continued the Bush bailouts, they further note, and he has "retained the main features of virtually every counterterror tool used by the Bush administration." Indeed, there's something eerily mechanical in the way the modern state steadily expands regardless which party or president holds the office." True. However, we've learned that liberty (both civil and economic) stand a better chance with gridlock under divided government than if either party is enabled by the voters to advance their platform unencumbered. So - let's vote that way. "... conservatives this year should have as their primary goal making sure Republicans wield all the gavels in Congress in 2013. If Republicans do, their committee majorities will serve as fine-mesh filters, removing President Obama’s initiatives from the stream of legislation. Then Republicans can concentrate on what should be the essential conservative project of restoring something like constitutional equipoise between the legislative and executive branches. Such a restoration would mean that a reelected Obama, a lame duck at noon Jan. 20, would have a substantially reduced capacity to do harm. Granted, he could veto any major conservative legislation. But such legislation will not even get to his desk because Republicans will not have 60 senators. In an undoubtedly bipartisan achievement, both parties have participated in institutionalizing an extra-constitutional Senate supermajority requirement for all but innocuous or uncontroversial legislation. This may be a dubious achievement, but it certainly enlarges the power of a congressional party to play defense against a president." Will has since backed off the perception he was opining that the presidency was a lost cause fore the GOP in 2012. But for those of us who recall the excesses of One Party Republican Rule under GWB as well as the more recent excesses of One Party Democratic Rule under BHO, his original assertion points to a better outcome. The Dividist prefers a re-elected Barack Obama with a Republican controlled Congress, for all the reason George Will explained here. "I’m not going to fully delve into divided government, but this much should be said. Pending one party had control of both chambers, presidents’ legislative power would diminish when competing against a truly majoritarian Congress (not necessarily a bad thing), and he/she would be forced to resort to more frequent vetoes (because legislation is passed more rapidly and because it is more ideologically extreme) to demand compromise… which probably wouldn’t happen to any significant extent. If the U.S. didn’t have an independent executive, this wouldn’t be as big a problem (like many parliamentary systems). But in the American system, it has just as much potential to deadlock the system as split chamber control." I am not clear on where the Professor is going with this, or exactly what he is suggesting as reform. He is promising more details in a future post and we'll stay tuned. The Dividist perspective is that nothing is broken in Congress that cannot be fixed by a more palpable public demand for action a/la David Mayhew. Unfortunately, that may require an impending crisis, as little else seems to sufficiently motivate the American electorate. And nothing motivates our Congress like a motivated electorate. Fortunately or unfortunately, we are within a few years of exactly such a crisis with our unsustainable levels of spending. Maybe it happens in the lame duck session at the end of the year. Maybe it happens next year. It'll happen. Even with our "dysfunctional" divided government. Or because of it. 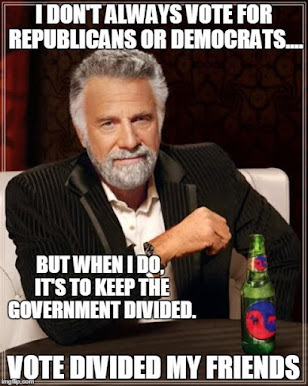 Divided government isn't the same as paralyzed government. Sometimes, division fosters creativity, allowing fine public policy to emerge from partisan wrangling. Consider the Tax Reform Act of 1986 -- the best piece of tax legislation enacted in the last quarter century. President Ronald Reagan deserves much of the credit for its enactment, having championed reform against long political odds... The debt-limit debacle was a case study in the perils of intransigence. The nation averted disaster, but only barely. And only by kicking the can down the road. If we are ever going to solve our long-term debt crisis -- and keep it solved -- then lawmakers had better rediscover the virtues of compromise. As Niskanen pointed out, "divided government is not the stuff of which political legends are made, but, in real life, most of us would take good legislation over good legends." Put The Dividist in that "prefers good legislation" camp. "Unlike Parliament, where the majority party or coalition of parties chooses a Prime Minister, who thereafter is in charge of pretty much the entire government, control can be split in our system, as it is at the moment. Democrats control the Senate and Presidency, and Republicans control the House, with cooperation between the two being required for anything to happen, including the yearly budget, without which the government shuts down. Whether or not the possibility of divided government is a good thing is up for debate (personally, I'm fine with it), but our government was deliberately set up to decentralize power, so as to prevent the rise of a new king or other unitary wielder of power." Good luck with that syndication deal Mr. Stibbons. In the meantime, "I'm fine with it." is good enough for the Dividist. Welcome to the United Coalition of the Divided. Well. That was helpful. Look, everyone know that Congress will not act until it must act. It's the nature of the beast. Given what we face between now and the new year when automatic spending cuts and tax increases go into effect, it is highly probable that Congress will act by then. It will probably be last minute, and it will be a compromise that makes no one happy, and it will happen in the lame duck session. The fact that there is a deadline and the election pressure will be lifted should make this a sure thing. Recall the David Mayhew "Divided We Govern" reference earlier. This is the key point - Divided government doesn't work until it does. Divided government works when it needs to. If we listen to what the pundits of the right and left and what the analysts in the Reuters piece have to say, we clearly need a solution before "sequestration" and the expiration of the Bush tax cuts kick in at the end of this year. So... it will happen. "American investors are most likely to say a politically divided federal government (73%) is hurting the U.S. investment climate "a lot," according to a Wells Fargo/Gallup Investor and Retirement Optimism Index survey. The federal budget deficit (66%) and the unemployment rate (62%) are also among the issues investors are most likely to say are hurting the U.S. investment climate. Investors are least likely to list the availability of credit as a problem from the eight items tested." "Altogether, this suggests that investors believe the recent political gridlock over the debt-ceiling and budget has been extremely harmful to the U.S. business climate. Presumably, they’re concerned that this could continue should President Obama be re-elected along with a GOP Congress, or vice versa. You could argue that there’s solid evidence to back up such fears: Standard & Poor’s downgraded the U.S. due to the political dysfunction over the debt-ceiling, and congressional gridlock has prevented any substantive policy changes on jobs, tax reform, and a host of other major issues. That said, the S&P’s downgrade didn’t diminish the global markets’ trust in U.S. debt, the market has continued its bull run, and the real economy has shown signs of turning around as well, despite the split between the GOP House and the administration." "It is a hard argument to fault. Divided government just makes legislating harder, numerous political science studies have shown. That leads to significant policy uncertainty, which can have a major impact on the economy. Last year, for instance, Congress spent weeks bickering over the budget and the United States debt ceiling, causing gyrations in the stock markets, driving down consumer confidence and eventually prompting Standard & Poor’s to downgrade United States government debt for the first time. " The Dividist finds this poll and reaction particularly interesting, as it contradicts investor attitudes we have seen and documented over the last three election cycles. We have tracked a meme we call "Investors Love Divided Government" since the inception of this blog, including posts in 2006, 2007, 2008, 2009, 2010, 2010, 2011 and 2012. Over this time the general perception of the investor community has been favorably inclined toward divided government, with an expectation that markets will benefit during periods of divided government. Now, the Dividist has repeatedly stated we do not believe that over the long or medium term, there is any credible correlation between political parties in power and stock market performance. However, short term market effects around the catalyst of a national election are a different story. Investor psychology and emotion (whether driven by fear or greed or both) can and does drive market short term movements. As noted before, if a preponderance of investors believe that divided government is good or bad for the market, it can be a self-fulfilling prophecy. Intrade, many analysts, and the Dividist are predicting a divided government outcome in the November elections. The markets have been surging in the first quarter of the year. There is a divergence between the results of this poll, expectations for the election, and investor attitudes in precious election cycles. The Dividist is on the case. With that we conclude this edition. Look for the 53rd Edition of the Carnival of Divided Government Três et Quînquâgintâ (LIII) - Special May Day Editon - sometime on or about May 1. Please submit your blog article at the carnival of divided government using our carnival submission form.